Shower chairs are used for people who find it difficult to stand in showers or sit in bathtubs. Whether the need is related to recovery from surgery or a more permanent state, the use of shower chairs can make bathing more comfortable and easier for both the person using it as well as for the caretaker providing the assistance. 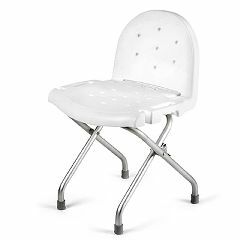 Allegro Medical offers a wide variety of handicap shower chairs and handicap shower benches to suit every situation and need. Here you will be able to find everything from simple, adjustable stools to heavy-duty shower wheelchairs.